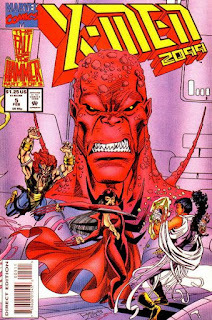 Gentlemen of Leisure: X-amining X-Men 2099 #5 - Patreon First! "Lightningstrike: Fall of the Hammer Part Three"
The X-Men become embroiled in the "Fall of the Hammer" crossover. As Fitz escapes from Alchemax's security forces, on Valhalla, floating above New York City, Meanstreak, Krystalin & Bloodhawk are confronted by Heimdall. He takes out Meanstreak & Bloodhawk, but Ravage helps Krystalin escape. Below, as the crowd cheers the return of Thor, Fitz commandeers an aircab to get up to Valhalla, recalling how the X-Men arrived in the city and were caught by Alchemax at the apartment of Meanstreak's friend Jordan Boone, prompting the group to split up & Fitz to be captured. As the cab climbs higher, it suddenly gives out, but someone grabs Fitz to prevent him from falling to his death. On Valhalla, Loki appears before Meanstreak and offers to disable the neurotech that gives Heimdall his powers, allowing the X-Men to knock him out. Loki then reveals himself as Boone, having undergone Alchemax' genetic restructuring process to gain powers for himself. Just then, Fitz arrives, along with his rescuer, Dr. Doom. Fed up with the environmental harm being done by Valhalla, Bloodhawk takes to the sky, intent on destroying it, only to be blasted down by a bolt of lightning hurled by an angry Thor. SPIDER-MAN 2099 #15 showed the Jordan Boone end of his communication with Henri and the Alchemax goons attacking him, and on-screen in #4 must count too, so this isn't exactly his first appearance. But... the collectors probably aren't quite so peculiar about this case as some others. I like the idea of this crossover. The previous SPIDER-MAN 2099 issues had built up a bit to the floating city thingy in low-key fashion, and obviously with the whole Thorite religion, so it worked nicely at least as a Spider-Man 2099 story arc. But damn if it wasn't aggravating back in the day that "Thor"and "Heimdall" weren't the ones familiar from (Simonson's) THOR. Obviously that kind of was the point of the story, but you know.